Check out our references to the days of print journalism, Fender bass guitars and more in this edition of the Pi roundup. I confess, I don’t receive the MagPi magazine – which is a shame for a print enthusiast like myself, because it looks like a handsome and skillfully made publication. It’s also a shame because I could have received a new AIY projects kit from Google, which would have let me add voice recognition and AI capabilities to the Raspberry Pi projects that I am definitely going to get started on one of these days. Issue 57 of MagPi comes with the aforementioned add-on board, which is a joint project of Google and the Raspberry Pi Foundation. It’s probably the simplest way yet to add voice recognition to Pi projects, though it’s far from the only one, of course. You can use Google’s voice recognition API with your own hardware, you can wire it up to Amazon’s Alexa voice assistant – suffice it to say, there are options. I was thinking it would be fun to make something spectacularly useless with a kit like this – RFIDing all my clothes and then asking “OK Google, how many pairs of socks are left in my drawer?” for example – but others will likely come up with much more meaningful and practical uses for the AIY kit. Another sweet HAT is the Pisound, an audio board that lets you turn a Raspberry Pi into an amplifier, recording device and even an effects module, so you could plug in your old P-Bass and lay down a bass line, make the Pi into its own instrument and more. It looks easy to use and enormously versatile, so it’s no wonder that the IndieGoGo campaign was apparently quite successful. You can pre-order one from the makers – a group calling themselves Blokas – over at their website. It’s interesting that one of the central selling points of the Raspberry Pi has always been “well, you can turn it into a fully-functional computer if you hook a keyboard, mouse and monitor up to it!” And that’s always been the case – you can stick some lightweight Linux distro on there and proof-of-concept your way around your new simple desktop computer – but it’s never been the best thing you could do with a Raspberry Pi, nor, indeed a very good option for a regular old desktop. Big-time Pi manufacturer Premier Farnell, however, has made said option a bit more attractive with the release of the Pi Desktop case. It’s an enclosure for your Raspberry Pi that addresses many of the deficiencies the little device has in comparison to purpose-built desktop machines – Wi-Fi, Bluetooth, a real-time clock and even an mSATA interface so that you can hook a proper solid-state storage drive up to it. It looks pretty good, too. 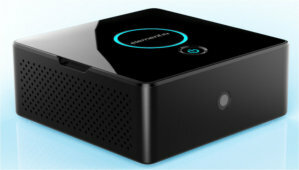 The Pi Desktop will be available in North America on June 5 and will cost around $51.